In 2014, the iconic Airspace wind tunnel in Charleroi, Belgium opened to the public. The beautiful ISG tunnel opened with a bang hosting the first of two Charlewars events. Behind the scenes, Steve & Magali Braff worked tirelessly to build Airspace into a world-respected brand. 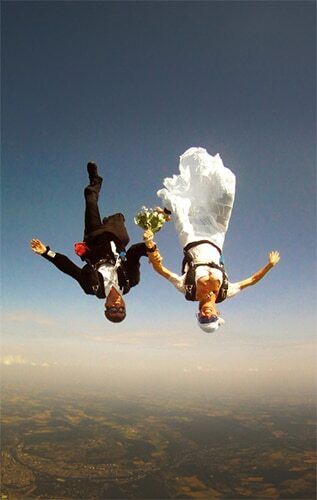 Eventually, the couple decided to move on and have created an independent consultant agency for indoor skydiving. Operating under the Starfly brand, Steve & Magali are helping new indoor skydiving businesses find their wings. Founders of StarFly.World got married in the air. They are passionate skydivers and tunnelflyers. StarFly is the leading independent consultant for indoor skydiving businesses. The company built and successfully operated the first vertical wind tunnel in Belgium and is currently offering professional assistance to numerous wind tunnel projects across the globe. StarFly was founded by passionate skydivers who have flown in over 50 countries worldwide. Today, StarFly are the only consultants who offer tailored end-to-end solutions for indoor skydiving businesses, including location selection, technology selection, business plan creation, target segment analysis, marketing advisory, operational advisory, HR advisory, and more. Our competitive advantage is our comprehensive knowledge and understanding of launching and operating indoor skydiving businesses successfully. That includes our remarkable ability to analyze the audiences, recognize highly profitable target segments, design marketing strategies to tap into them, and convert them into loyal customers for life. This is made possible by our vast experience with every kind of indoor skydivers, from first-time flyers to pro flyers. We integrate our close understanding of their unique requirements to create sensational marketing strategies that are supereffective. Thanks to our strong understanding of the indoor skydiving business, we create compelling business plans with achievable numbers, thereby ensuring a greater chance of funding by investors. We create practical timelines, optimize the costs of setup and operations, and maximize the profitability of indoor skydiving businesses. Work closely and have strong working relationships with all prominent wind tunnel manufacturers in the world. Have worked with the best wind tunnel instructors in the world, know them personally, and understand their unique requirements thoroughly. Experts in all wind tunnel technologies (propeller, open-flow, wall-to-wall, and recirculating), all sizes (12-feet to 17-feet wind tunnels), and all designs (one channel, two-channel and multichannel wind tunnels). With a strong emphasis on delivering an unforgettable and educational experience for the participants, StarFly helps entrepreneurs build the next generation wind tunnels for their indoor skydiving businesses.